Welcome to Wednesday Random TV Recall, otherwise known at WRTR...because I'm lazy. When I was growing up in the country, TV was a sad thing. There were only 4 channels available to me: NBC, CBS, ABC, and PBS. As a child, watching TV was almost an art. There was a serious lack of cartoons or children aimed programming, so remembering the schedule was a must. It became even worse when you got into your teens. Really, PBS was the only station that had cartoons on almost everyday, but at 12-years-old Sesame Street wasn't cutting it. Luckily, PBS, being the incredibly smart station is was, made some shows that were for older children. One such program: Ghost Writer. 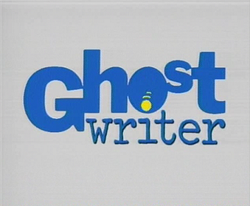 For a few glorious years, Ghost Writer was my show. Ghost Writer is about exactly what you think it is: a ghost that writes. (You weren't thinking that? Oh...) Not only does he write, but he helps solve mysteries. Yes, the introduction is horrible, but remember 1.) It was 1992 and 2.) I was 12. I also happened to have a life-long dream of becoming a writer. What amazed me were all the people that had cameos on the show. My favorite was Julia Stiles. Back then no one knew who she was, but I remembered her name (I'm weird like that). When 10 Things I Hate About You came out, I was on the phone with my sister, reminding her that Julia was from Ghost Writer. In the show, the kids wore felt pens around their neck, so they would always be able to get in touch with Ghost Writer. Eventually I started doing that. I was a susceptible kid, so what? Wanna fight about it? The thing I loved the most about the show was that it took place in NYC. I went to the city every summer as a child and watching the show was my NYC fix for when I wasn't there. I would watch every scene trying to see if I knew where they were. I believe I only recognized one place in 3 years of the show, but for the life of me I can't remember what it was. Anyway, that's all for WRTR this week.